« We Are Seeing Some Wading Water! Two New Fly Fishers In The Works! Pretty warm days! Think is has been in the 90s past 3 to 4 days and we are looking at more in this range. Slight chance of rain Friday, but temperatures holding warm. Defintely had some wading water Friday and Saturday. Supposed to have had off water most of yesterday, but they turned it on around 9:00 a.m. Good news about this was the fact that they turned it on very low….maybe 1300 cfs, so it was a great flow still for wade fishing. Generation all day today and we will just have to see what happens the rest of the week. It is that time of the year when they need power during the week as businesses fire up for the day. Probably see some off time over the weekend…..hope…hope! Friday, Jim and Stan had out a group of guys from Iowa out all day. I think all but one of them had fly fished before. John, who was in the boat with Stan and his friend Ron, has fished with us over several years. He now has a place in Florida so he does a lot of salt water fly fishing. Stan’s guys had a very good day on the big ruby, the holographic green crackleback and the P&P midge. The water was off when they put in but two units came on at 9:00 a.m.. Once the water cleared up, fishing was back on. Jim had Russ and Ed. Good day for these new fishers on the CQ streamer, a red midge and a black midge. Dana had Phillip, from West Virginia out for half a day. This was Phillip’s first experience with a fly rod and he did well on the CQ streamer, a rusty midge as well as the red midge. 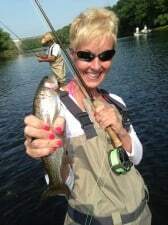 Darrell out half a day with new fly fishers, Pat and Barb from Arizona. They had a fun time. Caught some fish and learn how to throw that fly rod! Best pattern was the P&P midge. 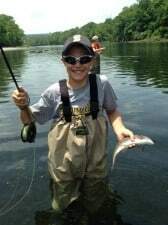 Jim worked with two new, future fly fishers, Blake and his brother Grant. Neat couple of young men who both picked up casting, and eventually hooking and landing fish on the copper dun midge with a blood worm dropper. 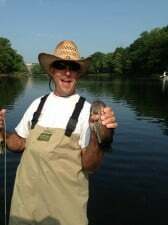 Their father, Ron, was downstream a little ways watching, fishing and catching on the CQ streamer. Ken and his friend John from Kansas, spent the day on the water with Stan. Very good days for these guys on the big ruby (water came on at 2:00 p.m.), the P&P midge and the holographic green crackleback. Did hook a few on a red soft hackle. Gina had out one of her regulars for the day, Dale from Oklahoma. They had a good and fun day on the CQ streamer, the flasher, a crackleback, a P&P and the little red midge. Dale pulled a nice brown out! 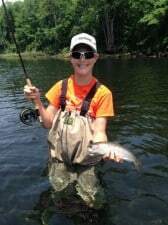 This entry was posted on Monday, June 24th, 2013 at 10:21 am	and is filed under Fishing Reports. You can follow any responses to this entry through the RSS 2.0 feed. You can leave a response, or trackback from your own site.